This was spotted by a friend of one of my good friends. A narrow street in the centre of Copenhagen. 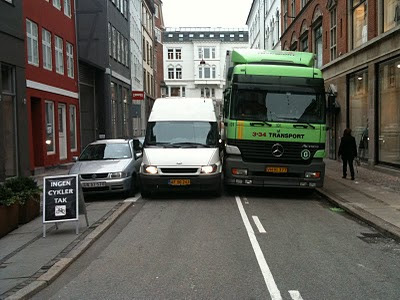 A parked car, illegally parked truck and a van trying to squeeze through. Probably taken in the morning before the shops open and trucks are allowed to deliver goods in the city centre, but funny all the same. Especially with the addition of the Ingen Cykler Tak sign on the left. Which means No Bicycles, Please. Meaning on the sidewalk outside that shop. But great shot all the same. This is EXACTLY the situation where you need a bicycle.